“Mom, you’re breaking my traction rod!” my 5 year-old son said to me as we walked (okay, more like I pulled him) through the crowd of people leaving a fireworks event on July 4th. The folks nearby chuckled, but I’m sure they had no idea what he was talking about. But I did. You see, my son is a train. He loves trains. He plays with trains. 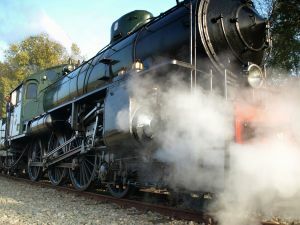 He can tell you about the different types of trains that exist today as well as those from yesteryear, and he watches any movie or TV show that involves trains. He can also do various whistles and toots from different kinds of trains. He wants to be a train driver when he grows up, and in his imagination he IS a train. He never walks or runs anywhere. He puffs and chuffs. In our house, when it’s bath time, that’s known as “going to the Steamworks,” where my kid gets a new, shiny coat of paint. His arms are traction rods. His feet are wheels. His legs are pistons. His nose is a funnel. His mouth is his whistle, and you don’t really want to know what his firebox is, but suffice it to say, when it gets “stuffed up,” that’s not a good thing. I have been told before that I ought to be concerned about his train obsession. Someone once told me that it isn’t normal for him to imagine that he is a train so much of the time. But I disagree. His imagination is part of who he is, and I won’t take that away. I do believe that there is a time and a place for everything, and although he lives in his imagination 90% of the time, he does know how to function very well in normal society, so I encourage his imaginative play. He comes by that imagination honestly. I have always had a vivid imagination, and I believe God gave it to me on purpose so that I might be able to use it for writing. Imagination sparks curiosity, creativity and cleverness, and I want to inspire my son toward those qualities, among others, and not deter him from them. 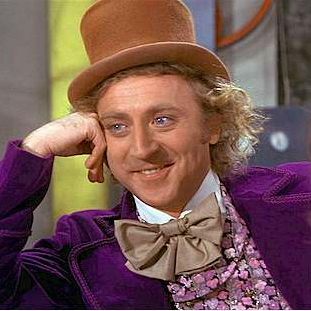 In the movie ‘Willy Wonka and the Chocolate Factory,’ Willy Wonka addressed the beauty of the imagination in the song, Pure Imagination. Our imagination is a gift from God, allowing us to believe that anything is possible. Add Faith to that imagination, and it is possible to truly change the world. And at my son’s next t-ball game, when he’s “chuffing” around the bases and tooting his whistle, you’ll see me there in the stands. I’ll be the one cheering for my favorite little engine. Share with me: What do you think about encouraging kids with imaginative behavior? Can imaginative play be a negative thing? What is your child’s favorite imaginary game? Did you have an imaginary friend or game when you were a kid? Oh my gosh, that's awesome … you're breaking my traction rod! I've gotta use that sometime. Brilliant. Oh my goodness, I LOVE This post! Your son is awesome. Seriously.Brogan is all about imaginative play these days. He's Captain Hook. I am Jake. Or the crocodile who tick-tocks. The only time I worry about his imagination is when he wakes up screaming in the middle of the night because there is a bumblebee in his wall. A really really big one, he says. Of all things…I have no idea why my son is terrified of bumblebees. He's never been stung. Jenny, you are such a good mother. I want to be you when I grow up 🙂 I so very much agree that we should encourage imaginative play in children. They will lose that sense of wonder all too soon as they grow up. You and I both know as high school teachers how hard it is to get kids to "look around" and "view paradise" once they've lost that imaginative spark. Great post! Oh, what a precious little boy you have. I have a four year old as well. He changes from frog to truck to baby to chicken, but I don't think he's ever tried a train. Finally getting around to viewing your blog and such! LOVE this post. Harrison is only 3, but he sees a "garage door" in everything, and pretends to be a garage door closing and opening half the time. We do get looks from people if we are at a store and he grabs a book and moves it up and down in a vertical direction while simultaneously making a motorized sound, but who cares? I think his ability to "see" certain things with his imagination is amazing, and we are careful not to discourage him or his way of thinking and pretending. I'll miss these days when they have passed.Thanks for sharing! Made me think of Hagan making the "whistling traing sound" downstairs in Sunday school a while back when we could hear him from upstairs and I laughed out loud! I can totally relate. I love these boys and their ingenious imaginations! I LOVE it! That is so cute.I had to check out this post because I swear I'm raising Jimmy Neutron. My son changes almost every empty cereal box in the house into some invention of some sort. I have had to make it a rule that you can't just rummage through the recycling because I got tired of putting the same tin can in the box 3x. My fav invention was a box that you put vegetables in and candy came out the other side. He had it rigged so that it worked but you could see that he wanted to figure out how to really change vegetables into candy.